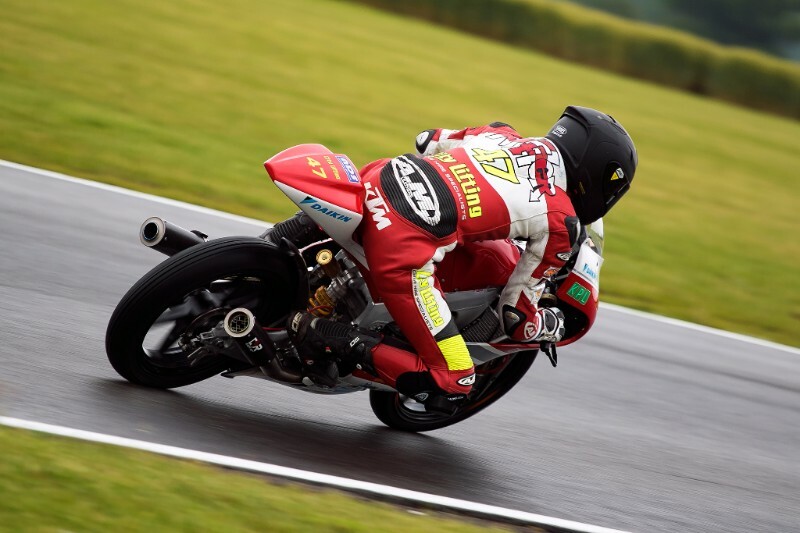 Round five of the Hel Performance Motostar Championship was held at Snetterton, Norfolk. The circuit underwent a major redevelopment starting in 2011 and the Snetterton 300 circuit is a 2.97 mile challenge of international racing standards. There was rain early Friday morning and when the Motostar riders went out for their free practice session it was on a damp but drying track. The conditions were difficult for the riders and the City Lifting team were constantly changing the settings to try to cope with the changing conditions. By the afternoon the track was completely dry for the start of the first qualifying session. The improved conditions enabled the riders to significantly reduce their times and Andover’s Jake Archer recorded a lap time of 2:03.582 after completing 13 laps during the half an hour session. It proved to be a tough Q1 as although a pit stop saw Archer return to the track and cut his lap time it wasn’t enough and he found himself in seventh position. His lap time was 0.732 seconds from the front row. On Saturday morning he went out for the second qualifying, however, the conditions were poor. It was raining and the track surface was very greasy which saw around eleven riders fall during the half hour session. As there was no possibility of matching Q1 lap times Archer sat out the first quarter of an hour to see if the track improved. He did venture out with 15 minutes left just in case the race in the afternoon was wet but clearly couldn’t improve on yesterday’s time. The first race was held on the Saturday afternoon on a completely dry track. Jake started seventh on the grid and quickly gained a position. The Andover rider then became involved in a battle for fifth place as he caught and passed Tom Booth-Amos. However, Dutch rider Brian Slooten was also battling very close with them and he slipped by both of them meaning that despite his best efforts Jake finished sixth at the end of race one. Jake Archer competed in the second race on the Sunday afternoon in good weather. With grid positions based on the fastest laps in race one Archer found he had to start from 11th on the grid. Despite this set back he made a fantastic start to the race and was up to 6th by the end of the first lap. Archer found himself in a group of four riders behind the leading trio, but as they were constantly changing places it meant that the front-runners were able to move further ahead. By the middle of the race Archer had been forced wide and dropped back to ninth position leaving him with all the hard work to do again. He dug deep and as he crossed the finishing line he had moved back into sixth position. Jake Archer remains second in the Hel Performance Motostar Championship on 123 points.